La variante CHASE existe…. auras-tu de la chance ? 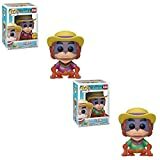 From TaleSpin, Louie and Louie(CHASE), as a stylized POP vinyl from Funko! Stylized collectable stands 3 3/4 inches tall, perfect for any TaleSpin fan! Collect and display all TaleSpin POP! Vinyl's!